Shares in the retailer were surging Wednesday morning after it reported the same-store sales uptick as well as top-line results that topped the analyst estimate. TJX Cos. (TJX - Get Report) can't stop, won't stop. The discount big-box chain may have missed Wall Street's forecast for its fourth-quarter earnings on Wednesday, Feb. 28, but it posted impressive comparable sales growth of 4%. Shares were up nearly 8% in early trading to $83.34, then slipped to $82.60 before 11 a.m. ET. The parent cof TJMaxx and Marshalls reported earnings per share of $1.19, compared with the anticipated $1.27. The $1.19 figure, however, reflects a negative impact from a debt charge and a pension settlement charge while Wall Street's forecast did not. 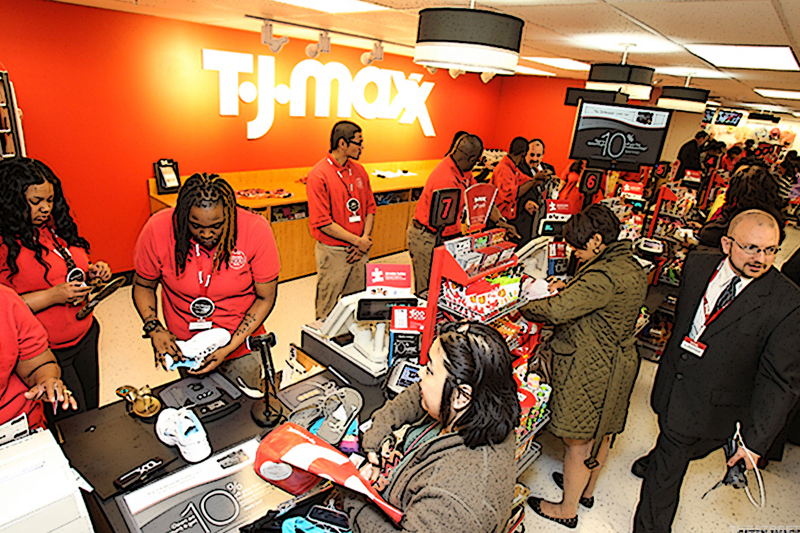 TJX' revenue exceeded the projected $10.76 billion, however, clocking in at $10.96 billion -- a 16% uptick since the same period last year. For the full fiscal year, net sales increased 8% year over year to $35.9 billion, the company reported, and same-store sales increased 2%. The comp sales increase marks the company's 22nd consecutive year of growth for TJX, according to CEO Ernie Herrman. Traffic and earnings both "meaningfully exceeded" the company's expectations, he said in a statement. "Customers responded to our great brands and compelling, eclectic mix of merchandise at excellent value," Herrman added. "We see abundant opportunities in the marketplace for major brands and high-quality merchandise and are pursuing numerous initiatives to keep driving sales and customer traffic." The Framingham, Mass.-based chain also said it would raise the regular quarterly dividend payable in June to 39 cents per share, a 25% increase from the current price. It will buy back up to $3 billion of shares this year, TJX said.